Christian singer Michael W. Smith performed his song “Friends” at President George H.W. Bush’s funeral on Wednesday. President Bush, who fought a long battle with vascular Parkinsonism, died on Friday, at the age of 94. According to Newsweek, Bush requested that his close friend, Smith, sing “Friends” at his funeral service. According to Christianity Today, Smith met Bush in 1989, when he performed at the White House for Christmas. The two became fast friends, they even went on vacation to Greece together. Reportedly the two bonded over their shared friendship with the late Billy Graham, who died at the beginning of 2018. “One thing that tied us together was his relationship with Billy Graham. There were times we would get Billy Graham on the phone and talk,” Smith said. This was the second major loss for the Bush family this year, as George H.W. Bush’s wife, Barbra, died just eight months before the late president. Bush’s son, President George W. Bush confirmed his father’s death in a statement released Friday. The statement read, “Jeb, Neil, Marvin, Doro, and I are saddened to announce that after 94 remarkable years, our dear Dad has died. George H. W. Bush was a man of the highest character and the best dad a son or daughter could ask for. 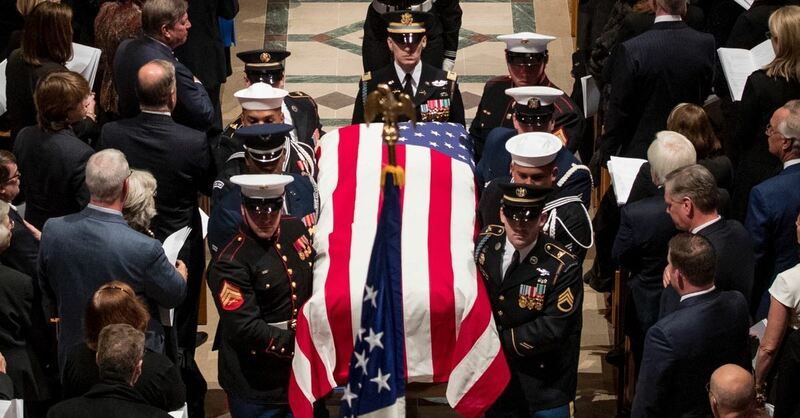 The entire Bush family is deeply grateful for 41’s life and love, for the compassion of those who have cared and prayed for Dad, and for the condolences of our friends and fellow citizens," he said.